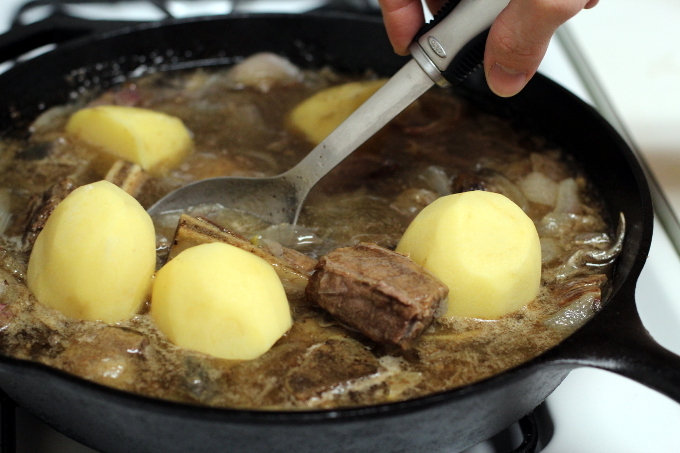 Zharkoe is a traditional Russian meat and potatoes stew. It’s a hearty dish, perfect for a cold day. 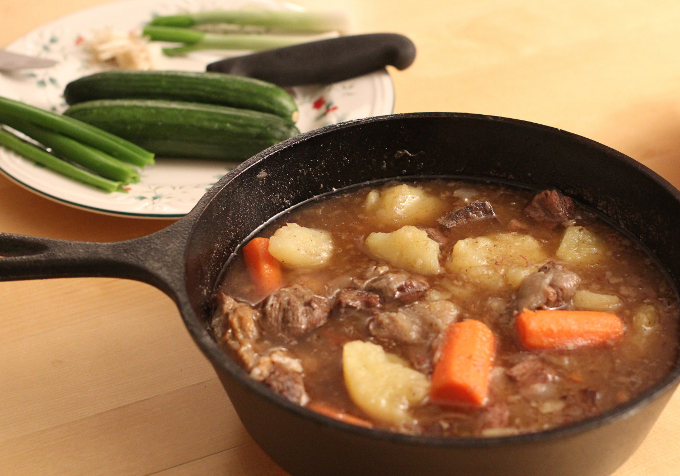 We’ve been talking about making a stew this winter, and we finally did, right before the season ended. It was a whole day affair – going to the butcher shop, getting groceries (for the stew, the chicken stock we were also making, and for basic everyday stuff), cooking, and cleaning up. It was worth it, though. This is one of my favorites of all the dishes we make. You can use any meat you prefer for Zharkoe – e.g. beef, pork, lamb, chicken. We asked the butcher what cut of beef would be good for stew. He recommended the chuck, a cut from the shoulder and neck. It has fat and attached to the bone. Our good butcher cut our beef in pieces for us, much appreciated, since we would need to use a saw for the bones if we were to do it at home. As pictured below, we had to use to two pans. For a minute there, we were like – um, yeah, we don’t have a pan or pot big enough for this. 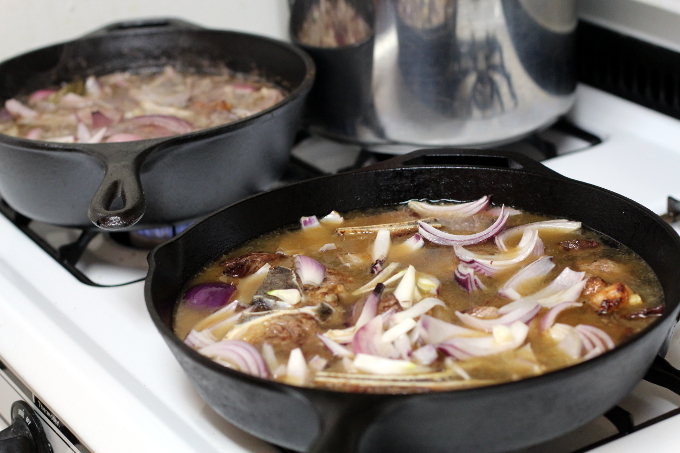 – Turn the meat over again and put the sliced onions on top. Broil for another 2-3 minutes. – Pour water into the pan and add bay leaves. Bring to a boil on the stove top, then lower heat and simmer for 2 hours. Stir occasionally. Add water (little by little) as needed. The liquid should be mostly covering other ingredients. 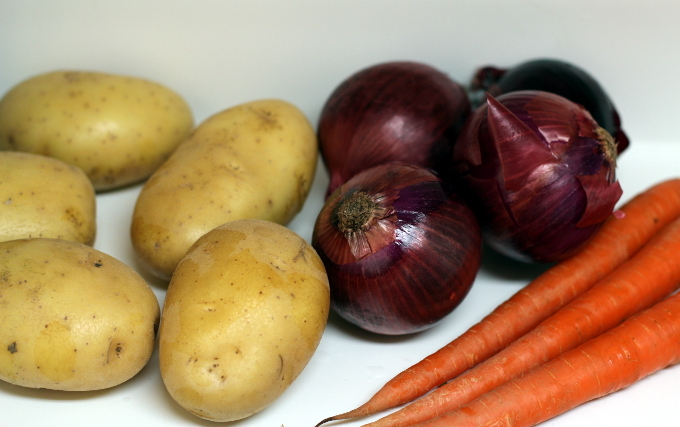 – Add salt, peppercorns, potatoes, and carrots. Simmer for another 30 minutes or until the potatoes and carrots are done. Take out bay leaves before serving. This a pretty heavy stew so it’s good with fresh cucumbers and scallions. But I enjoyed it the most with rice when we next had it for dinner. That’s my Filipino self in full form: stew + rice = mouth-watering good. George doesn’t agree. This Zharkoe recipe is big and at first we thought we’ll make half next time. But we ended up having it for three dinners every other night, with just a small bowl left after. It seems like a good amount, and we’ll keep it as is.